[symple_icon icon=”bolt” size=”normal” fade_in=”false” float=”left” color=”#fff” background=”#000″ border_radius=”99px” url=”” url_title=””]IMPORTANT NOTE: I often speak in terms of a “business” website. Since most physician offices and their websites are designed to attract and bring in prospective patients, as well as nurture the relationship of existing patients, it is wise (in my humble opinion) to treat a medical website as a business generating vehicle. There are close to 1 BILLION websites online and medical adoption of digital marketing is at an all-time high. Now ask yourself this: How confident are you that your own medical website doesn’t have cracks in its foundation? 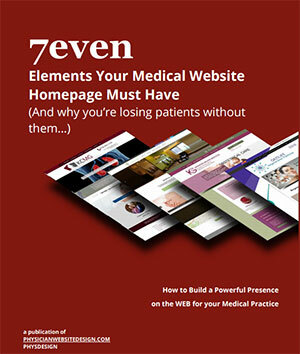 Does your medical website just look great, or does it also work hard to grow your practice? It’s not just about design, you see. Even some of the BEST looking websites can offer a BAD user experience. But it’s not all doom and gloom! In fact, the HUGE number of bad websites out there gives YOU the opportunity to set your website apart from your competitors’. The Key to Standing Out is Making a Great First Impression. Your homepage is the “face” of your medical business and is usually your prospective patient’s very first experience with you. Whether a visitor becomes a patient (or leaves your site for good) can be determined largely by the effectiveness of your homepage. Yet, because of their simple nature, a shocking number of physician website designs both underestimate and underutilize their homepages. …And these medical practices are losing potential patients (and often current patients) every single day! A HIGH Bounce Rate Amounts to Lost $$$ in Missed Patient Retention. The number of prospective patients who visit your homepage (via links, organic search ranking, PPC advertising etc.) and leave your website from that same page is called your “bounce rate”. Although no one has a 0% bounce rate, (heck, less than 20% can be extremely difficult to achieve), it’s essential to optimize your homepage to reduce your bounce rate as much as possible. Well, approximately 50% of potential patients are lost because users can’t find the information they need on a webpage and that 40% of visitors do not return to a site when their first visit is a negative experience (Forrester Research). This means it’s up to you to ensure that your homepage clearly presents your patients with all the information they need in order to take action, or risk losing your patient forever! It’s good business sense to maximize any opportunity to acquire new patients and generate revenue, but it matters NOW perhaps more than ever before. That’s because, as online advertising booms, more and more medical practices need to make sure their website presence is optimized and maximized! In order to avoid wasting your marketing dollars and webdesign investment, you need to make every click count. In the meantime, this handy guide will help you identify and avoid common homepage mistakes, turn more clicks into conversions and drastically reduce your bounce rate. 1. Easy Navigation: Give your prospective and current patients a clear map. Have you ever been hiking? If you have, you’ll know how helpful those strategically signposted maps along the path can be – especially when you’re on an unfamiliar trail. They’re always comforting to see when you’re starting to question which way you should go. And you know that even if you veer wildly off course you’ll have the guidance you need to find your way again. Doesn’t it make sense to offer that same reassurance to your website visitors? Treat your website like an unfamiliar trail and sign post it for your current and future patients so that they can always find their way around, even if it’s their FIRST time there. By using clear links and an intuitive navigation menu. These core homepage features let you highlight your most important pages, making it easy for your patients to find what they need (and easy for you to strategically point them to the information you want them to see). Don’t use “cute” labels. Visitors should know what to expect to find behind each click BEFORE they click. For example, if you have a patient portal, don’t tuck it away on the lower half of the website, or just in a dropdown menu item. This type of web element should be featured prominently in the website header and exist in the same place no matter where the visitor is in the website. TIP: Keep it simple. Your navigation menu should be laid out very clearly and should remain consistent across all pages on your website. Consider using drop-down menus to easily organize your content. You have 3 seconds before they slam the door in your face. You have extremely limited time to tell prospective patients what medical services you offer, persuade them to stay on your homepage AND to complete the action that you want them to (usually call for an appointment). Once they have clicked through to your website you have your foot in the door, but they are still ready to SLAM it shut. So, get your most important message across in an attention-grabbing, clear and prominent headline. We often get asked if short headlines or long headlines are more effective and there is no golden rule for this. BUT, a good headline is simple and clear while appealing to your prospect’s self-interest. Don’t be lengthy if you have nothing compelling to say, but remember that salient information always trumps brevity. Your prospective patients don’t want to have to work to figure out WHY they should care about you, your office or your medical specialty. In fact, they won’t try to figure it out. If your the benefits of your medical specialties aren’t immediately apparent, they will leave. That’s because your prospective patients are not buying your medical service – they are buying the benefit that your medical service offers them. So, keep this question in mind when you write everything from your headline to your page copy. By telling your prospective patients what your medical service will do for them, you make a much more compelling statement than you do when you merely list the features that your medical service has. Your benefits should appeal to your prospective patient’ emotions, so highlight the fantastic outcomes that they will see, how it will meet all of their needs and solve all of their problem. I know that may sound a bit dramatic, but too many medical marketers make the mistake of thinking that the benefits of their offers are obvious. Sure, the benefits of your medical practice may be obvious to you, because you know what you do inside out and you know why patients should be calling your office. Your prospective patients do not. Tell your current and prospective patients what to do. It’s crazy how many people pour SO much effort into attracting current and future patients that they forget the purpose of getting these folks to the website. It’s no good getting people to your website if you don’t take every opportunity to prompt those visitors to action. IMPORTANT: Confused visitors don’t waste time trying to figure out what to do. They leave your website and they don’t come back! So, how can you get these visitors to “stick”? One really effective way to do this (and increase your conversions, decrease your bounce rate and turn your webpages into powerful lead generation tools) is to include a clear “call to action (CTA)”. It really is simple – when it’s done right! A strong CTA tells your current or prospective patient in no uncertain terms what they need to do next – which could be anything from making an appointment, to entering your patient portal site, to downloading a patient registration form, to subscribing to a newsletter, to getting in touch with you, or watching a video. AVOID: Being ambiguous. If you tell your patients to “Go”, “make an appointment” or “subscribe”, then tell them WHERE they are going and WHAT they are doing or subscribing to. ALWAYS: Restate what they’ll get when they complete the action. For example “Download Patient Forms” is a stronger, more compelling CTA than “Download” or “Click Here” Finally, make sure your CTA stands out from the rest of your page elements… Give it the space it needs to be seen. Make your contact information easy to find. Ever been on the verge of contacting a doctor, hospital (or company), and realized that you need more information before you can even pick up the phone? Sometimes you just need to fire off an email with a couple of questions… other times actually speaking to a human gives you the confidence to commit. Your prospective patients are no different! Don’t assume that your website visitors will have the patience or time to sift through pages looking for your phone number. Wasting time looking for your details will frustrate even your MOST interested prospective patient. And, don’t forget, a negative user experience can cost you up to 40% of your website visitors – who then go straight to your competitors! So, it’s critical that you make yourself accessible to your website visitors from the moment they arrive on your homepage. Best Practice: Include your contact information in the top left, or top right, corner of your homepage. Also, user preferences will differ and it’s important that you allow people to contact you on THEIR terms. So, give them the choice – Provide a phone number, email address and a contact form. It’s good business sense to include contact information on every page of your website. But you don’t need to make this as prominent as it is on your homepage (you may choose to include it in the footer or sidebar of your webpage, for example). The point is this: always be accessible whenever a prospective patient has a question or just wants to get in touch. Time to hook your prospective and current patients. There is a good rule that I like to use when it comes to good copy… the “2 C” rule: Make it Clear and Compelling. To write compelling copy, it’s best to remember that every word on your homepage has a purpose. And, because homepage copy is brief, every word counts. If you’ve got words on the page just to fill space… I would suggest deleting them. Clarity is important in your headline and tagline, but a part of writing clear copy is finding your voice (and speaking to you ideal patients). IMPORTANT: Don’t write to appeal the general public – write to appeal to your current and prospective patients. This will help you craft a clear and compelling message that resonates with the type of patients you actually want. Remember to keep your tone appropriate to the type of patients you see and consistent across your website! Ever noticed when a handful of your Facebook friends share the same link you just HAVE to click on it? But if you were to happen upon that same link by yourself you may not have any interest in it. We’re hardwired to believe that, if other people have tried something and liked it, it must be good. For example, say you drive into a town that you’ve never been to before and you’ve got two restaurants to choose from. You can’t tell much about them from the outside, but one of them has a full car park and the other has an empty car park… which do you pick? Sometimes just seeing that people have tried something is enough to persuade us it’s a good option. It only makes sense for you to capitalize on this basic bit of human psychology by adding social proof and context to your homepage. Use testimonials: Patient Testimonials add a human element to your homepage, helping to earn your patient’s trust with “social proof ”. Knowing that you have patients who are already happily using your medical services will give them a certain amount of confidence in you and your office.